A $10,000 reward is being offered for information leading to the arrest of a suspected serial cat shooter in Oakland. Melissa Colorado reports. A $10,000 reward is being offered for information leading to the arrest of a suspected serial cat shooter in Oakland. 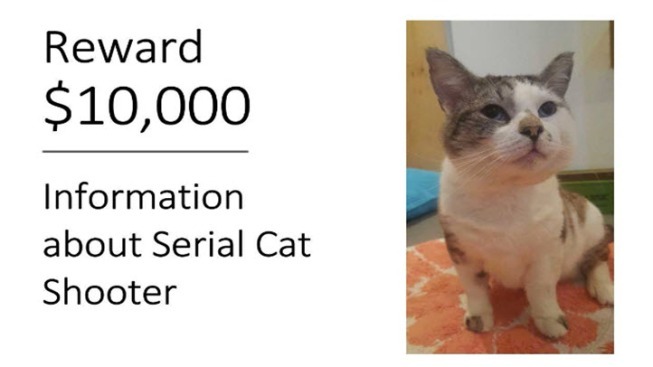 The reward announced Monday comes after Oakland Animal Services took in four cats over the last five weeks suffering from severe injuries. The cats were all shot by pellet guns, according to a Facebook post by the Oakland Animal Services. One of the injured cats was hit in the spine and had to be put down. Anyone with information about the incidents should contact Oakland Animal Control at 510-535-4895. The Friends of Oakland Animal Services is offering the $10,000 reward. To contribute to the reward, visit crowdrise.com/justice-for-cats.